In 2018, PNGi published more than seventy reports, articles and profiles that all highlighted aspects of the rampant corruption afflicting Papua New Guinea. This corruption is distorting the economy, entrenching gross inequalities, causing immeasurable harm and suffering to individuals, families and whole communities and it has destroyed our democratic government. Looking back across the reports, there are many reoccurring themes that are worthy of further analysis and discussion. These include the high prevalence of land fraud, the conspicuous impunity enjoyed by senior politicians, the gross conflicts of interest that undermine good governance and the breadth of the corruption in the purchasing and delivery of medical supplies. Papua New Guinea has one of the most egalitarian systems of land ownership anywhere in the world. More than 80% of the population live in rural communities where the rights to occupy, farm and gather from the land are supposedly protected through customary rights. In urban centres, land laws are meant to defend the rights of leaseholders. In 2018 though, PNGi highlighted a raft of cases in which the rights of both customary landowners and urban leaseholders were abused while PNG’s political classes demonstrated their ability to unlawfully leverage land acquisition to enrich themselves and their cronies. A four-part expose of the Woodlark Island logging scam provided an in-depth examination of how foreign businessmen are able to collude with powerful locals to illegally acquire the rights to vast-tracts of valuable rainforest thanks to the connivance of government departments. For decades those living in State housing in urban cities have enjoyed no better protection, thanks to the rotten National Housing Corporation and its Managing Director, John Dege. Taking From the Poor to Feed the Rich was the title of PNGi’s three-part expose that led to a petition calling for a police investigation. Thankfully, NHE Ltd is no more and John Dege and some of his cohorts are now under arrest. We wait to see if these developments signal broader changes in behaviour at the NHC. Perhaps the most infamous case of land fraud to hit the headlines in 2018 was the Manu Manu land scandals. The central role played by Ministers William Duma and Fabian Pok were highlighted in the in-depth examinations of the two land frauds published by PNGi. One fraud netted its masterminds more than K46 million in illicit profits, the second K15.4 million. Politicians though are not the only ones who profit from illicit land deals involving the State. In Land Fraud Hits Lae, PNGi illustrated how, with Lands Department blessing, lucrative state leases can be illicitly given away by public officials at a discount to private individuals who then sell for a quick profit, often leaving a trail of destruction behind them. The impunity demonstrated by both Ministers Pok and Duma in escaping any liability for the tens of millions of kina stolen in Manu Manu land scandals is a theme which appeared time and time again in PNGi investigations in 2018. 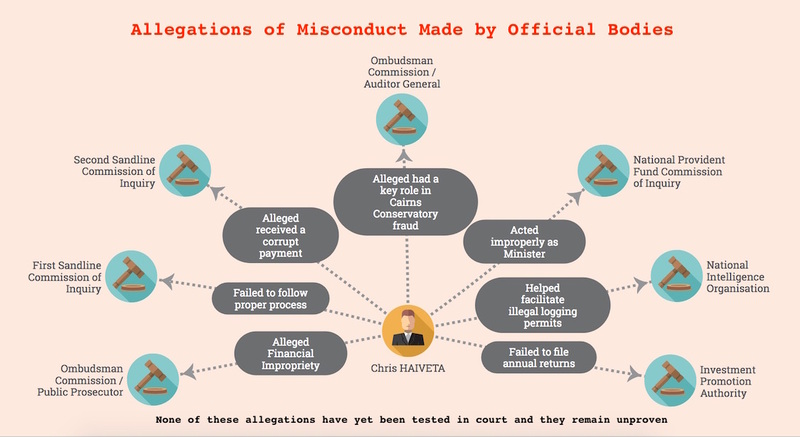 In-depth profiles of long-time leaders like Chris Haiveta, Fabian Pok, Michael Nali and Peter Yama each exposed how these high-profile politicians have time and again avoided liability despite being recommended for further investigation or prosecution in Commissions of Inquiry, other administrative processes or even by the courts. In the case of Chris Haiveta, for example, he has been centrally implicated in three high-level scandals over the past twenty years – the Sandline Affair, the National Provident Fund fraud and the Cairns Conservatory scandal – yet each time has escaped any criminal charges and managed to remain at the centre of power. Haiveta has also been linked by the National Intelligence Organisation to illegal logging and unlawful campaign financing and narrowly escaped a Leadership Tribunal over accusations of financial impropriety. Similarly Fabian Pok, the current Minister for Defence, who first entered Parliament in 1997, has sailed unscathed through numerous documented scandals. His conduct has been variously condemned in two Commissions of Inquiry, an Ombudsman Commission investigation, by the National Court at least twice and he was a central figure in the Manumanu land fraud. Another common characteristic shared by some of our most high-profile leaders is the casual way they seem to combine high political office with extensive business interests that sometimes overlap in the most alarming ways. Examples exposed in 2018 include an ADB funded bridge-building contract being awarded to a company owned by the Prime Minister, Peter O’Neill (in circumstance the ADB auditors described as suspicious); security companies owned by Environment Minister, John Pundari, being contracted to provide guards by the largest logging company operating in the country; and Works Minister, Michael Nali and his involvement in the Paga Hill real-estate development and links to Chinese owned works contractors. These conflicts seem to repeatedly defy the rules set out in the Constitution and Leadership Code but seem to go unnoticed by the Ombudsman Commission. One issue that featured prominently in much of the media about Papua New Guinea in 2018 is the appalling state of our health services and, in particular, the nationwide shortages of medicines and medical supplies. The New York Times even ran a feature story titled Papua New Guinea is Rich in Resources but Poor in Health. In 2017, PNGi published a three-part expose, Profiting From Sickness and in 2018, we continued to expose the corruption that underpins both the procurement and distribution of medicines and health supplies and the government’s deliberate inaction. In all, PNGi published eight reports on this subject in 2018. Perhaps most damning was the expose of how the government is stalling on reform despite an internal audit by the PM’s Department exposing much of the rot. Other reports and articles ranged from the first arrival of new medical kits, their distribution, a look at Health Secretary Pascoe Kase, the man in charge of this national tragedy, an example of how corruption has also infected international donor programs, the fatal return of polio, and the central role of one distribution company, LD Logistics. Looking ahead to 2019, two things are very clear. One is, the scale of the problem is not going to diminish. The impunity with which our leaders operate and the ineffectiveness and underfunding of key anti-corruption agencies mean that, in the short term at least, the scandals will keep coming and their rate and scale may even increase. Second though is that there is hope. Power ultimately does rest with the people and if we are all willing to exercise that power, change can happen. This does not mean though waiting for the next parliamentary elections in 2022. We all see corruption happening all around us everyday. What we must do is collect the evidence and share our stories. Already, we have seen dramatic impacts, like the closure of the Konebada Petroleum Park Authority, as a result of the efforts of anonymous whistleblowers. Indeed, many of the scams that PNGi exposes are brought to light only because of information that is shared with us by insiders or astute observers. So, in 2019, email PNGi – admin@pngiportal.org – to report what you see or hear and be a part of making change happen!